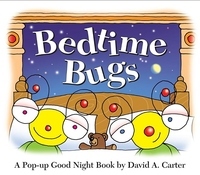 David A. Carter's zany bugs are here to help guide children through their nightly routines. The Bubbly Bugs are taking their baths, the Lullabug is reading a bedtime story, and the Twinkle Bug is shinging bright to grant the wish you wish tonight! This interactive Bugs mini is sure to become a bedtime favorite.